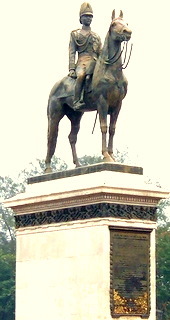 The King Rama V Equestrian Monument is the first monument dedicated to a Thai king. It stands in the Royal Plaza to the south of Dusit Garden, Bangkok. 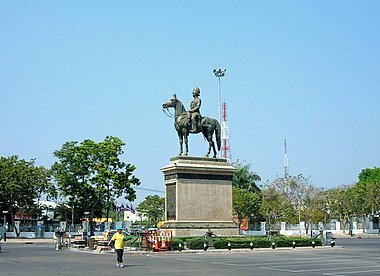 The monument depicts King Rama V astride a magnificent stallion riding high on a pedestal. The majestic dome of the Ananta Samakorn Throne Hall in the background completes the regal scene. Built to commemorate the 40th anniversary of the coronation of King Rama V or King Chulalongkorn, the King Rama V Equestrian Monument was completed 1908. Cast in Paris by a French sculptor, the monument took a year to complete. 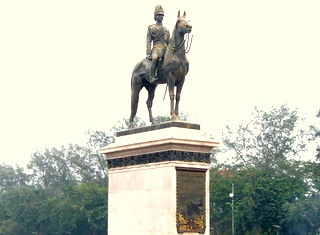 King Rama V inaugurated the monument himself. The funds for the monument were raised from public donations as an expression of the people's love and gratitude to King Rama V for his reforms in modernizing the kingdom. 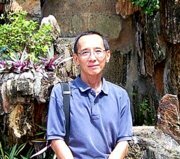 A million baht was raised, a huge sum of money in those days. After the death of King Rama V in 1910, his son, King Rama IV established Chulalongkorn University in Bangkok, in honor of his father, with the remaining funds. Visitors to Thailand in the 1980s would probably rememberthe 10 baht bank note which has the King Rama V Equestrian Monument printed on the back. These notes have since been withdrawn and replaced by the 10 baht coin. The monument is deeply revered by Thais who can be seen at all times of the day at the monument praying and paying homage to the great king. Some observe special days for visits, namely Tuesdays, Thursdays and Sundays. The numbers swell on 23 October, Chulalongkorn Memorial Day. Thousands stream along Ratchadamnoen Avenue towards the Royal Plaza, where the monument is located. Like most monuments it has tremendous emotional appeal and even in times of extreme tension, people turn to the monument for solace. A case in point was the massive demonstration held by labor movements to protest the privatization of state enterprises in May 2004. A crowd of 60,000 demonstrators rallied at the Democracy Monument, marched on the Government House and stormed the building when officials refused to see them. After union leaders defused the potentially violent situation, thousands of demonstrators went to the equestrian monument to pray and pledge never to allow the privatization of state enterprises established since the days of King Rama V.
For almost 100 years after his death, the memory and appeal of King Rama V remain as strong as ever. This is clearly manifested in the constant flow of people who pray at the King Rama V Equestrian Monument every day and night. To get there, please see the Dusit Garden map. To return to the splendor of Dusit Garden.